The last time I was in Disney World (before this visit) was when I was four years old. I hardly remember anything except being scared to death by the “It's a Small World” ride. As an adult on the other hand, I cherished every experience. Especially the food! Rockin' Roller-coaster (Hollywood Studios) – This was by far my favorite ride. We went on it twice! I'm a roller-coaster person as it is, but this was just over the top. Waiting to get on the ride, they play Aerosmith's “Walk This Way” and have a hilarious pre-ride show involving holograms of the band members. Seconds before the ride starts, an epic count down to the roller-coaster's launch pumps you up for one hell of a ride! Toy Story Midway Mania (also in Hollywood Studios) – Coming in second, this was such a fun ride/game! You're seated in what looks like a toy chest and as you go around the track, it stops at various screens. When you're stopped, it's time to start shooting targets, all in 3D! With each stop featuring a numerable amount of Toy Story characters, it's all fun and games! The game keeps score of points and announces the winner at the end. Of course my fiancé beat me. Guys are just naturally good a video games. Booking a vacation is a breeze with Disney's website. They have their stuff boiled down to a science. Not only is it very user friendly, their website can be used to plan your entire vacation from where you're staying to what's included in your package, choosing the attractions you want to see and even making restaurant reservations! 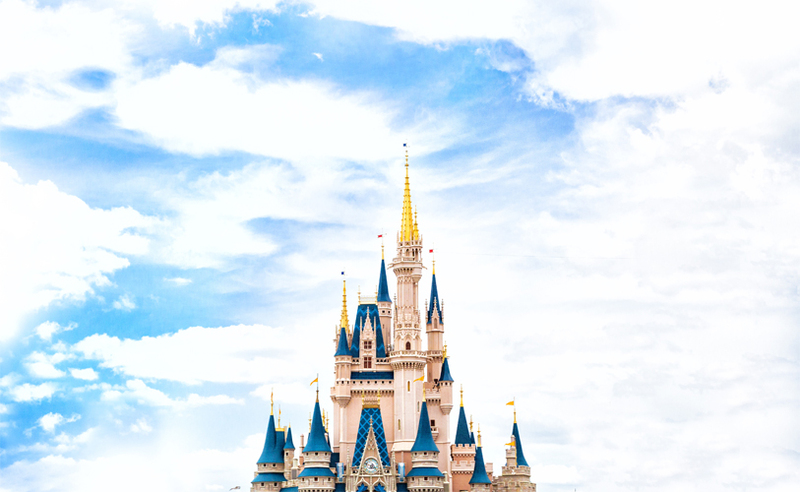 Disney World also has an app for smart phones which can be used to see real-time data in the parks such as ride wait times, show times and other attraction information. Disney recently implemented new technology in their parks called MagicBands; wrist bands that park-goers wear and can use for a number of useful things. If you're going, get one of these! You won't regret it. They're linked to your Disney account and can be used for admission to the resorts, parks, paying for food, merchandise, photos and more. One of the most handy uses is linking it to FastPast+ selections, which get you on to rides with hardly any wait! Those two favorite rides I mentioned? Yeah, we waited less than 10 minutes to get onto both of them. Definitely take advantage of this if you're going to Disney. During this visit, my fiancé (now, husband) and I were celebrating our engagement. The resort we were staying at gave us pins that said “Just Engaged”. They have them for all sorts of occasions like “Just Married”, “1st Visit” and more! We wore them everywhere and got the special treatment from everyone, including some free food and a premium viewing spot for fireworks. So many people congratulated us; employees and park-goers, alike! Really, everyone gets the special treatment in Disney. Ours was just extra-special. Although we didn't visit Animal Kingdom, we saw a lot of animals throughout the other parks. They are relentless and not afraid of humans! The ducks are hilarious, quacking it up and constantly begging for food. I thought this was funny. I'm sure they're all well-fed. So let's get down to business. The food, of course! Here are my thoughts on the food, atmosphere and experiences at the restaurants I went to. If you're planning a trip, I highly recommend checking these places out, as my experiences were all good ones. *Edit: This restaurant closed and was replaced by Trattoria al Forno in December of 2014. With an Iron Chef's name attached to the restaurant, I was expecting this place to be fantastic. I was not disappointed! Everything we ate was bursting with flavor. The seasonings in each dish created such bold, rich flavors, my taste buds were dancing with delight! The atmosphere there is high end, yet casual. Elements of the restaurant's ambiance create a rustic but elegant look and feel. They have an open kitchen where you can see the cooks in action as they create the masterpieces you'll soon be eating. As they cook, the chefs yell “Opa!” every now and then... especially when there's fire involved! Appetizers: Goat Cheese Sto Fourno (pictured above) - Creamy, gooey and delicious. Like a warm spinach artichoke dip but WAY better. This mixture of goat cheese, kalamata olives (my favorite kind! ), sweet red peppers and artichoke hearts is finished with a drizzle of the some of tastiest olive oil I've ever encountered... Served with a side of dandelion greens, I chose to mix them with the cheese and just eat it with my spoon. IT. WAS. DIVINE... A great way to start the meal. Hell, it was a great way to start vacation. House-Made Dolmades – My fiancé got the dolmades as an appetizer, which are grape leaves stuffed with rice that is seasoned with various spices. I had to try a little nibble of these jewels. For such a bite-sized morsel, they pack A LOT of flavor into these! Lemon, fennel and olive oil resonate as the main notes in this delicious, traditional dish. Entrée: Cinnamon Stewed Chicken (pictured above) – This chicken looks and tastes like it was slow cooked all day. The hearty meat and hint of sweetness from the tomatoes and cinnamon pair so well together, creating a comforting and delicious dinner. I chose to substitute farmhouse greens in place of herbed orzo pasta that comes with this dish. Curious, I asked our waitress what “farmhouse greens” actually are. Her reply? “If spinach and collard greens had a baby.” I was sold. This place looks and feels like a throwback 50's diner. Some tables feature an old tube-style television that plays black and white clips and ads in the background. The wait staff treat you like you're family... literally. Usually your waitress greets you by talking about “Cousin Jeff” or “Aunt Lola”, as if you were related. I witnessed a waiter yell “put that darn walkie talkie away at the table!”, as he slammed a newspaper down across the table from us, scaring a girl who was on her cell phone. Pretty hilarious. The waitress that was serving the table next to us tried to get a girl to finish her last bites of dinner by picking up the spoon and feeding her. Adorable! And of course the kid had ice cream after that. Entrée: Dad's Grilled Pork Chop (pictured above) – This pork chop was grilled to perfection... I mean, perfection! It glistened with caramelized grill marks and was laid over a bed of velvety garlic mashed potatoes. On the side was an arugula apple salad, topped with fresh fennel. The dish was the perfect mixture of savory and brightness. Not too heavy, not too light! The arugula, fennel and apples really balance the dish out, adding flare to an old fashioned favorite. 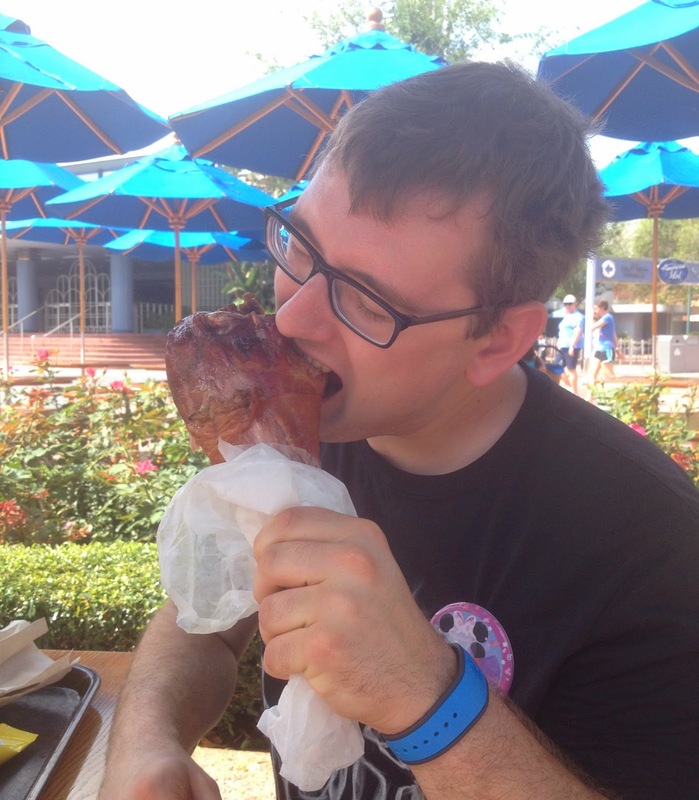 Another day in Hollywood Studios, we enjoyed one of the infamous smoked turkey legs at one of the quick service stands. I was almost able to finish one by myself, but they are HUGE. The flavor is fantastic and the meat is so tender. For a quick inexpensive meal, this will keep you full for quite a while! The Biergarten Restaurant is a neat place! It's front entrance looks like you're walking into a cave, sort of. Then, when you're taken to the dining area, it expands into this spacious room that resembles a village in Germany. With a buffet. We arrived just in time for a show, where performers brought out fun instruments, played music and invited people up to dance! One of the performers had a ridiculously large Alpine horn, which spanned all the way from the stage to the ground! They have an amazing selection of food and drinks. All of the wait staff are originally from Germany, as well – talk about authentic! Actually, every restaurant in Epcot features ethnicities from each respective country, throughout. Leave it to Disney to go that extra mile, right? We asked our waitress about what life in Germany was like before she moved to America and it was neat to get a little insight. Adding to the unique atmosphere of this restaurant, the seating arrangements are at family-style, communal tables. This Bavarian tradition encouraging people to mingle while they eat and drink. I suppose after a couple of beers, people become quite friendly with the strangers at their tables. Coincidentally, we ran into the people we were seated with the next day in one of the theme parks! It was kind of dark in the restaurant so I didn't get very good pictures, unfortunately. Entrée: I ate lots of stuff. Too much. So much that I don't remember everything. Lots of German sausage which I washed down with some red wine. Food hangover afterwards. It was worth it. This was absolutely my FAVORITE restaurant in Disney. The food? Phenomenal. Atmosphere? Open, friendly and fun. The bar's stools are literally bongos, circling a colorful arrangement of décor in the restaurant. The building itself is shaped like a pineapple, making it a very tall and spacious structure! Amongst the hustle and bustle of Downtown Disney, this is a place you must stop at for some authentic Cuban cuisine! Appetizer: Shredded Beef Stuffed Plantains (pictured above) – So... I have a weakness for plantains. Next to sweet potatoes, they're probably my favorite starch. Served crispy, they are so much better than french fries or potato chips could ever be! What better place to order them than at a Cuban café? Molded into little cups and stuffed with beef, onions, tomatoes, paprika, cumin, chili and other delicious spices, these plantains were over the top; like a mini meat cupcake! Entrée: Lechon Asado (pictured above) – This pork leg is slow roasted til it melts in your mouth. It was served with an onion-lime mixture called mojo sauce, which was delicious. My favorite starch came into play again, this time fried sweet. The main differences between green and yellow plantains are their levels of sweetness and preferred cooking methods. Green ones are better for serving crispy and salty; yellow for soft and sweet. Drink: South Beach Mojito (pictured above) – No, this drink isn't by any means South Beach Diet approved. Did I care? Um, I was on vacation, of course not. I figured why not get liquored up a bit before Cirque du Soleil? Splurging a little, I enjoyed every sip of this refreshing citrus-mint drink! It came with a slice of sugar cane sticking out of the glass. Admittedly, I had never tried fresh sugar cane. Biting into it, I noticed it was very crispy and juicy, leaving a fibrous material behind after consuming it. We got to keep our glasses as souvenirs, which was nice! Overall, our vacation in Disney World was amazing. If you're planning a trip, I hope you find this guide insightful! Graphic designer by trade, food & beverage enthusiast at heart.